For weekend accommodations before and after your stay with us on the island at ReefCI on Tom Owens Caye, Placencia has many options that fall into 3 broad categories of accommodations. Budget Conscious Traveler: Only the bare essentials needed! Economy Traveler: Cost friendly but with comfortable amenities! Luxury Traveler: The best Placencia has to offer! Affordable, beach-front rustic cabanas in the heart of Placencia village. Julia’s offers affordable nightly, weekly, and monthly accommodations on the beach. Their business is owned and operated by a local family that has roots in Placencia spanning back generations. Julia’s is literally just footsteps away from the beach and less than a 5 minute leisurely walk to grocery stores, banks, restaurants, open-air beach bars and much, much more. Comfortable, clean accommodations for the budget traveler. Lydia’s Guest House is owned and operated by Lydia Villenueva who is renowned for her traditional Belizean hospitality. She cares about the quality of each guest’s vacation and strives to provide a pleasurable, relaxing, and affordable stay. She believes in giving her guests good value for their money and offers them clean, comfortable, and safe accommodations at the north end of the Placencia sidewalk. Anda Di Hows Hostel provides budget-oriented, sociable accommodations where guests can rent a bed, usually a bunk bed, in a dormitory style setting with a shared bathroom. Anda Di Hows Hostel offers a full kitchen for your use as well as a coffee maker. Covered veranda area with hammocks and a bar where you can make your own drinks. Inside you can hang out at the curvy Rasta Bamboo bar. In the bathroom they have the famous bottle wall. Every bed gets it’s own fan, free WiFi, and lockers for your use. Cozy Corner is located in the heart of the Placencia peninsula on the pristine sandy beach, kissed by the refreshing turquoise waters of the Caribbean Sea. Spectacular is an understatement, for beachcombers have described ‘Cozy’ as “Heaven on Earth”. Their amenities include beachfront rooms with ceiling fans and standing fans, air conditioned rooms with cable T.V., and kitchenette area. The beach bar/restaurant is where relaxation is completed with a cool beverage of your choice, and the tastiest of Belizean cuisines are prepared. Come and experience this barefoot paradise of perfection. Seaspray Hotel rests between Placencia’s world famous sidewalk & the inviting Caribbean Sea. Centrally located within Placencia village, Seaspray Hotel offers a variety of accommodations, ranging from seaside cabanas for those who want the comforts of home to their economy rooms for those on a budget. SeaSpray’s range of rooms is perfect for accommodating students and other large groups. Paradise Resort is an excellent mid-range choice. Paradise Resort, formerly known as Paradise Vacation Hotel, has 12 air-conditioned rooms with cable TV and private baths with hot and cold running water. They are located on the water at the southern end of the Placencia peninsula, or Placencia Harbour. The Serenade Hotel is a family owned operation. They strive to provide outstanding quality and personalized service. 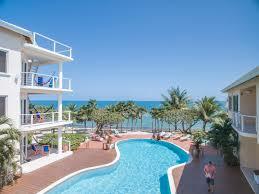 The hotel is in Placencia village, within walking distance of almost everything. They strive to provide a clean, safe, comfortable, and affordable place. Their beach rooms are spacious airy rooms with comfortable beds and quality linens, AC, ceiling fan, TV, table & chairs, fully appointed private bathroom with hot and cold water, shower, and soaps. The rooms are nicely appointed to make your stay at Serenade Hotel comfortable and relaxing, enjoyable, and hassle free. Daily maid service makes sure your room is always ready for you. Free high-speed Wi-Fi is available all the time. The One World Rentals are beautiful, fully equipped, immaculate and comfortable studios and apartments in the heart of Placencia in southern Belize. Only a short walk from the beach and located conveniently close to shopping and restaurants, it is the perfect place to get the feel for the “real” village life. The popular One World gift shop offers a wide range of souvenirs. The attached laundromat along with the book trade makes this small resort attractive. Nirvana is a boutique all-suite hotel in the heart of the village of Placencia on the beach. It is very conveniently located close to bars, restaurants, and shops. Nirvana has 5 individual suites/studio’s, each with wide verandas overlooking the Caribbean. There is also a rooftop deck with panorama views of the Caribbean sea to the east, the beach front and the Maya mountains to the west. Nirvana is a great place for couples or the suites are ideal for 2 people to share. Situated a couple of miles out of town, Robert’s Grove is a beautifully appointed hacienda-style Belize beach resort nestled on 22 acres of the finest white sand beach in Placencia. Robert’s Grove is a resort with full facilities including a number of different dining options. Robert’s Grove is dedicated to making sure that your visit to Placencia, Belize is fun and memorable. Whether you’re looking to explore the unique natural attractions that make Belize so special or you just want to relax on the beach and be pampered, they guarantee satisfaction. Chabil Mar is a personal paradise of luxury accommodations and ambiance, while only a stroll along the beach to the center of Placencia Village. Chabil Mar is dripping with flowers, immersed in the natural beauty of Belize, and nestled along the Caribbean with 400 ft. of private beach and pier. Three Iguanas Villa is arguably the finest private villa for rent by owner in Placencia. The Villa has 5000 sq ft of upscale design and construction that is loaded with special features exuding casual luxury. An iguana mural on the turret as you enter, a wide variety of trees and plants in the garden, ceramic tile, and tropical hardwoods throughout, lots of comfortable lounge chairs, custom-designed upscale bathrooms, AC, marvelous mattresses, combination safes, and kitchens in each suite, on site caretaker/housekeeper — and a roof-top plunge pool! “Yes, you can have it all” – All the amenities of a private home – security, convenience, space . 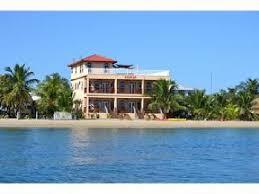 . . All the attraction of the beach, Placencia Village, the Caribbean – is just a short walk away. Is the Maya Beach Hotel your kind of place? Where people smile because they like it there, and the typical guest is not necessarily a typical tourist? The Placencia peninsula is an area thriving from eco-tourism; ideal for travelers who appreciate the natural beauty and cultural identity found in Belize. From this little beachfront inn you can kayak, take long beach walks, cycle to a friendly nearby village, and swim in the Caribbean. And that’s just before breakfast. Add a tour or two and spend the day snorkeling, diving, fishing, manatee sighting, bird watching, jungle trekking, jaguar spotting, Mayan pyramid climbing or cave tubing, and you’ll be ready for a good meal in the lively Maya Beach Hotel Bistro and a good nights’ sleep in a simple, beach-basic B&B-style room. Arrive with a smile, and leave with a bigger one, that’s Maya Beach Hotel. Tucked away on the lush Placencia peninsula in southern Belize, Laru Beya is the perfect place to both do nothing and experience everything. Their quiet and modern beachfront resort is built for relaxing; with hammocks on every balcony, with a pool, restaurant and bar are mere steps from your room. Want to experience local food and culture? They are just a short walk from the Garifuna village of Seine Bight and three miles from the restaurant- and nightlife-filled town of Placencia. And when you’re ready to really go exploring, Laru Beya (which means “on the beach” in Garifuna) is also conveniently located for adventure, allowing you to easily go visit Mayan archaeological sites, explore caves, or thrill at local wildlife.